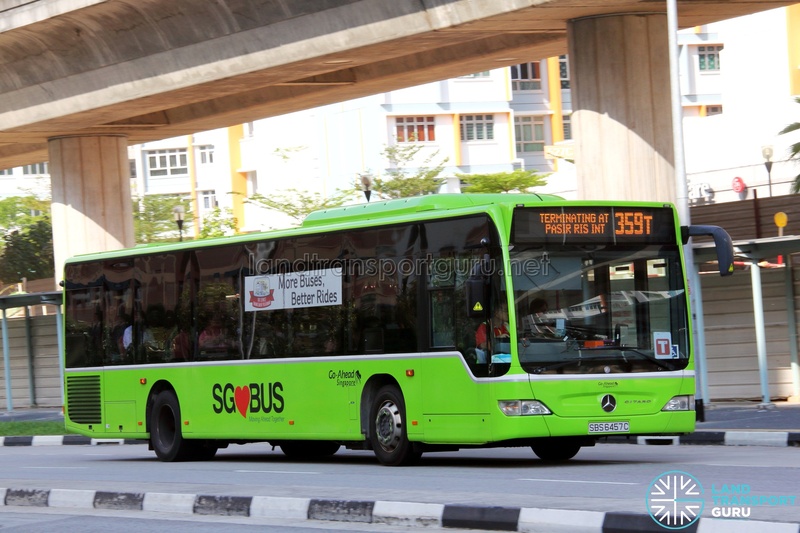 Go-Ahead Feeder Bus Service 359 is a Feeder service operating from Pasir Ris Interchange and looping at Pasir Ris Street 71 and Street 11, passing through Pasir Ris Drive 3, Drive 12 and Drive 1 . It operates as a dual-loop service, calling at Pasir Ris Interchange twice in a single trip. 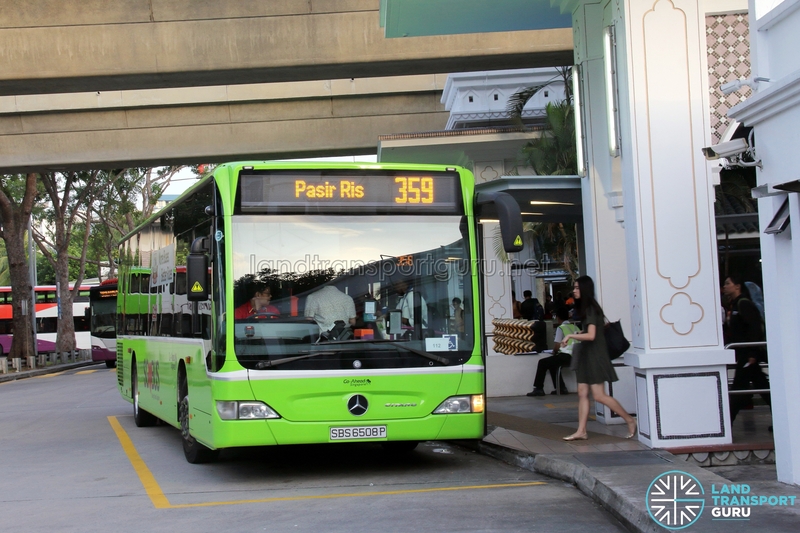 Service 359 buses will continue to the other loop at Pasir Ris Bus Interchange. Service 359T buses will terminate at Pasir Ris Int. Feeder Service 359 serves residents and schools around Pasir Ris Neighbourhoods 5, 6 and 7 on the West Loop, and Neighbourhoods 1, 2 and 5 on the East Loop, connecting both ends with Pasir Ris Town Centre. A full trip of Service 359 will first ply the West Loop (via Pasir Ris Street 71) followed by the East Loop (via Pasir Ris Street 11), while calling at Pasir Ris Interchange between loops. Terminating trips will display as Service 359T to indicate that the bus will no longer continue its journey after reaching Pasir Ris Interchange. In which case, commuters can either change buses at Pasir Ris Interchange or wait for the next non-terminating trip. At Pasir Ris Interchange, different boarding berths are used for the West (Berth B7) and East (Berth B6) loops. Passengers should check the service direction before boarding the bus. The Townlink branding for Service 359 was dropped in August 2018. In 2014, a Peak Period Short Service (PPSS) variant of this route, 359P, was introduced. It duplicates the entire of 359′s East loop and operates during the Weekday peak hours, operating with private buses. The service was withdrawn from 19 Sep 2016 as part of the Changes to PPSS in Sep 2016. My child is taking bus no. 359 to and from school daily. However, we realised that the frequency of bus 359 is terrible. At her school bus stop ( near Coral Secondary School ), my child always faces this problem of having to wait for a long time for her bus. 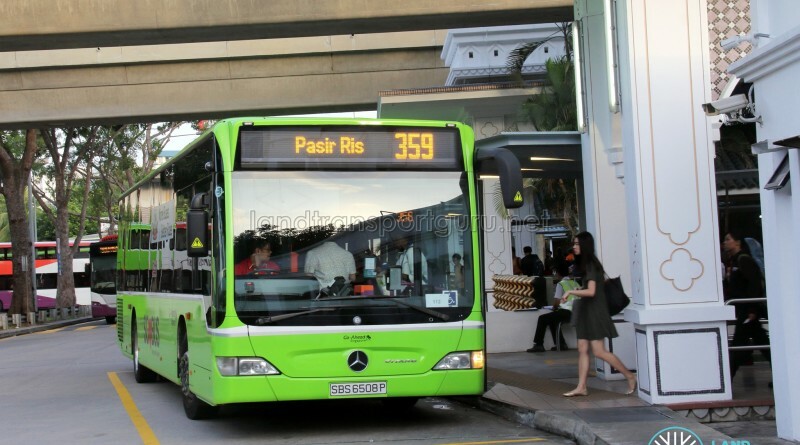 In between her bus arrival, there is always at least 2 to 3 buses of 359T which only travel and end at Pasir Ris Interchange which do not continue from go to area near Elias Mall. In fact just today, 28 March 2016 between 5pm to 5.30pm, 4 buses of 359T came to the bus stop but not a single 359 !!! This is inefficient and so unfair to other passengers ! I need to know why is the frequency of 359T, 3 or 4 times more in compare to 359 , which actually serves a larger number of passengers as it covers a larger area. Please kindly look into this problem and kindly give me a reply on this issue ! At Coral Secondary School bus stop, the scheduled arrival for non terminating 359 buses are at 1701hrs and 1725hrs. Moreoever, Peak Period Short Service 359P operated by MyBus (Loh Gim Chong Transport) which passes by Coral Sec only terminates at Pasir Ris Int.